Given the choice, we’ll take the small car nearly every time. However, this Christmas was one time we opted for something a bit bigger. Whenever we go back to Minnesota and Wisconsin for Christmas, we log a lot of miles over several days. A few of those days includes hauling three or four people around in the car along with their luggage and Christmas gifts. 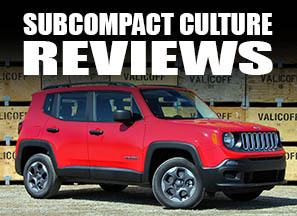 Let’s face it: A subcompact can be too small sometimes. We had the opportunity to drive Kia’s 2014 Optima EX Hybrid over 10 days and nearly 800 miles in the upper Midwest. Frankly, we were very happy to have a larger car for our Midwest driving tour, aka, our annual holiday visit. 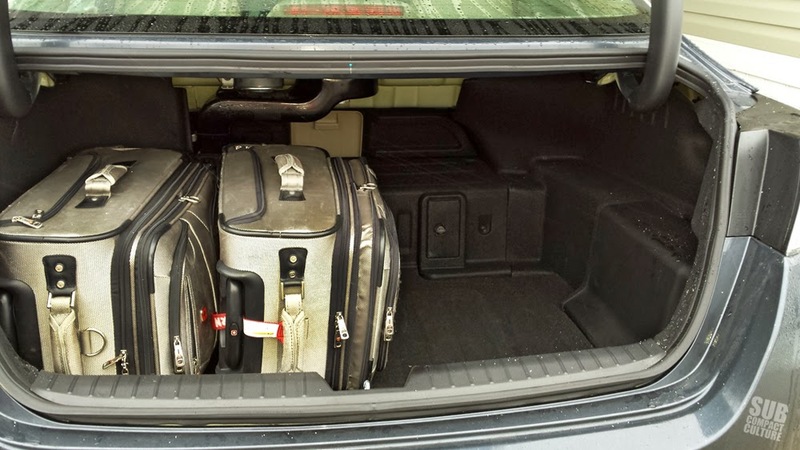 When we picked the car up, one of the first things we noticed about the Optima Hybrid was its trunk size. We were expecting it to be mammoth. But since the car is a hybrid, it has a big battery pack, and that eats into trunk space. While the standard Optima has 15.4 cubic-feet of cargo space, the Hybrid has only 10.8. Getting everything into the trunk took a bit of Tetris-like maneuvering, and that’s just for the two of us. When we picked up my mother-in-law, we definitely had to put some stuff in the back seat. Our Optima EX Hybrid was well appointed with features including Xenon headlamps, fog lamps, 17-inch wheels and tires, a very crisp Infinity sound system with a UVO navigation system, and our favorite aspect, heated and cooled front seats and heated rear seats; and a heated steering wheel—ideal for the frigid Midwest. Those heaters get darn warm, too. The power folding mirrors also proved their worth several times while parking in tight spaces. 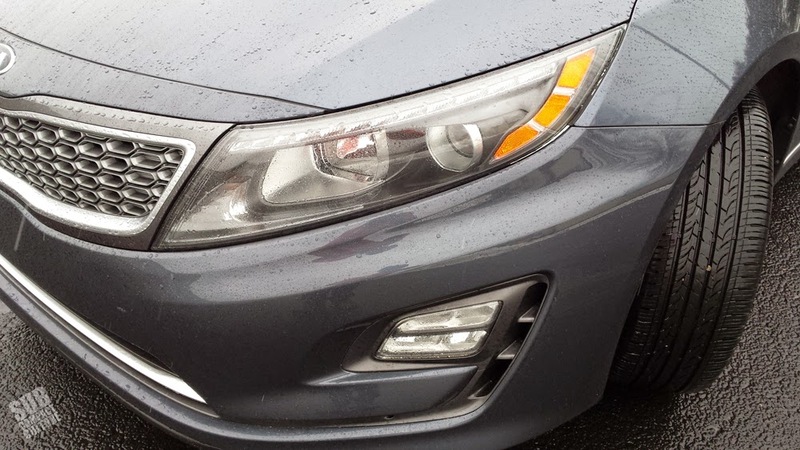 The Optima is a comfortable car, but not without its flaws. The passenger’s seat is not height adjustable and is very low; everyone that rode in the front seat mentioned it. Shorter passengers complained about not being able to see over the dashboard. The driver’s seat is height adjustable. 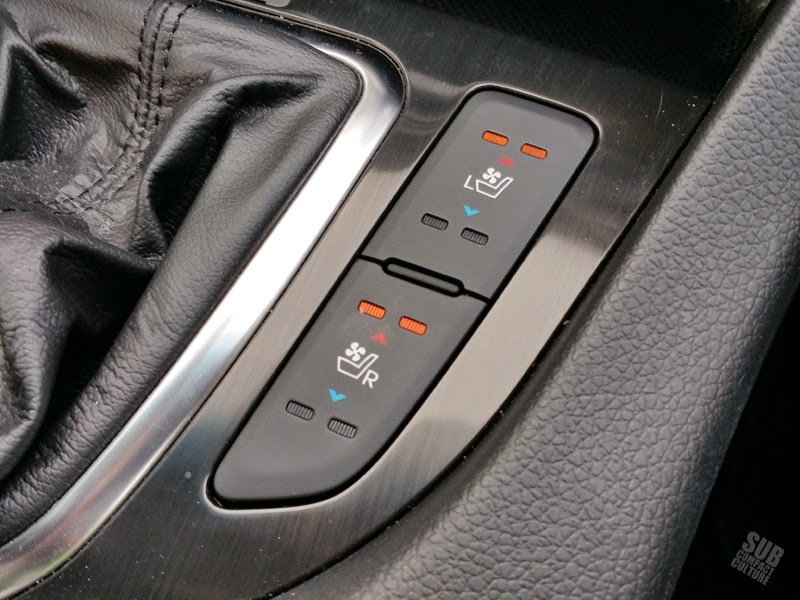 Despite the nicety of heated rear seats, the rear seat bottoms are canted at an angle making egress challenging. Plus, everyone who rode in the back complained about the seat belt buckle receivers; they would sink into the seats when trying to buckle them. 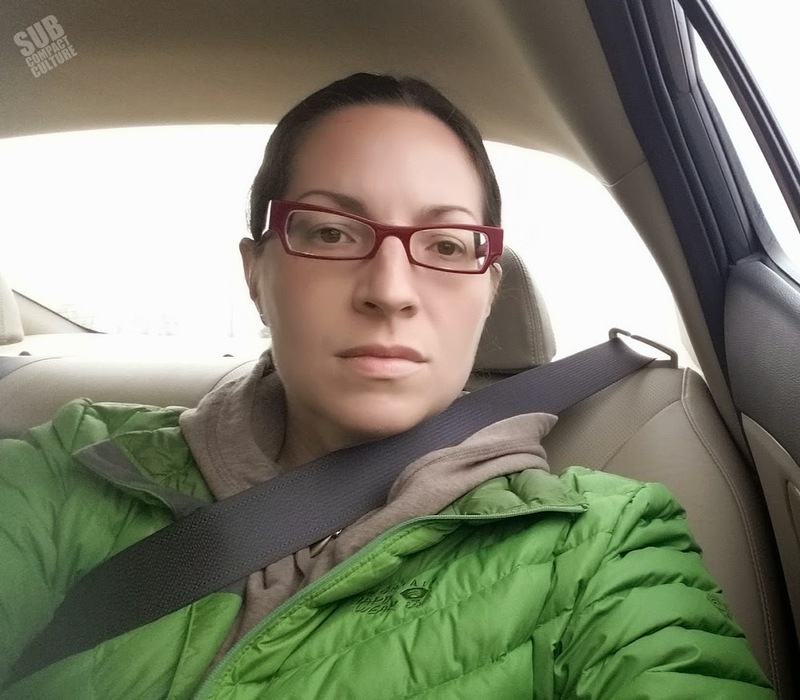 Mercedes, at 5’4”, also said the rear belts cut across her neck, which was uncomfortable; she used a scarf or her hood as a seat belt pad. Otherwise, we found the interior classy and stylish; modern and functional; a great road-trip vehicle. 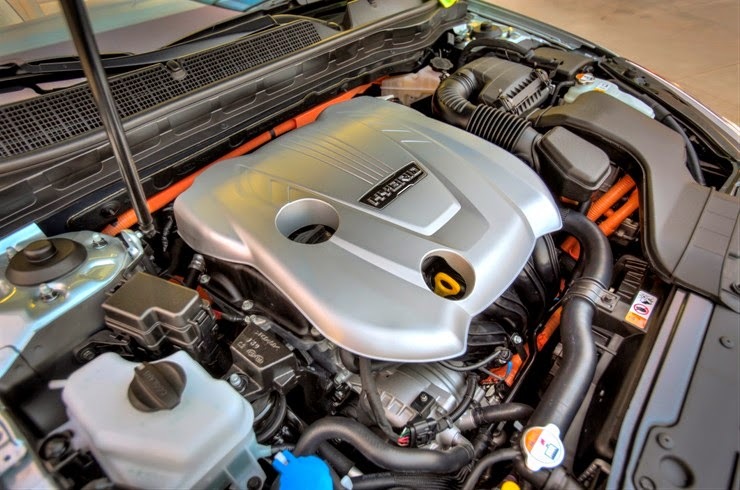 Powered by a smooth 2.4-liter four-cylinder engine and electric motor, the Optima Hybrid generates 199 total system horsepower. The car has ample acceleration, especially from a dead stop. 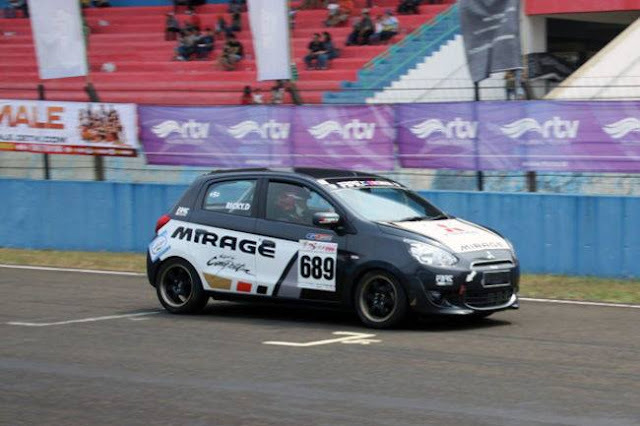 And as long as you have the Eco mode turned off, throttle response is quick and passing power is adequate. In terms of powertrains, this could’ve been the perfect car for our Christmas trip. 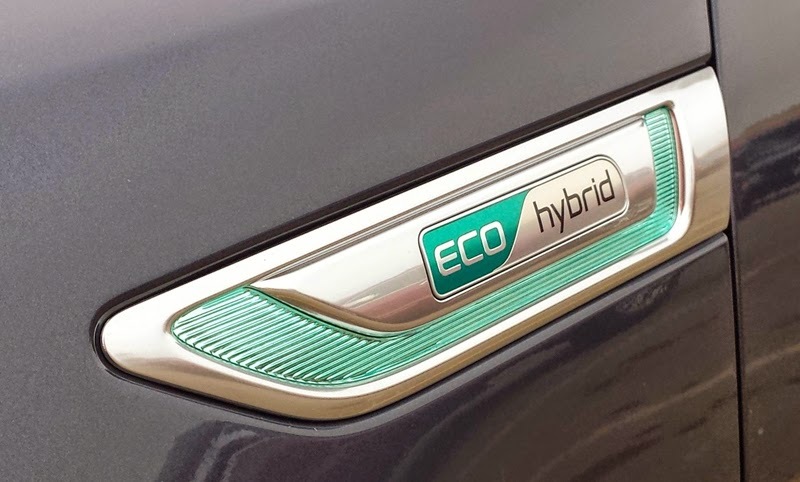 The Optima Hybrid is a fuel sipper rated at 35 city, 37 combined, and 39 MPG highway. That equated to a range of over 500 miles. We only stopped for gas twice. Overall, we saw about 34 MPG combined—not bad for a car this size and weight (3,622 lbs). The car’s hybrid system worked very well, too. Kia says the car will stay in EV mode up to 62 MPH, but our tester generally switched to gas mode at about 35 MPH or so in the city. However, the EV Mode light would come on while cruising on the highway at speeds (60-72 MPH). The transition from EV to gas was nearly seamless—no herky-jerky switchover. Also, this is a very quiet cruiser, and there weren’t any rattles to be had; it felt very well built and tight. By the way, the car handled the snow pretty well; I thought perhaps the EV mode might lend itself to lots of wheel-spin when things got slick. But, alas, this didn’t happen. Oddly, the car was more susceptible to crosswinds than I thought it would be. It would take two hands on the steering wheel when it was breezy. I also felt like the car wanted to wander a bit on the highways. 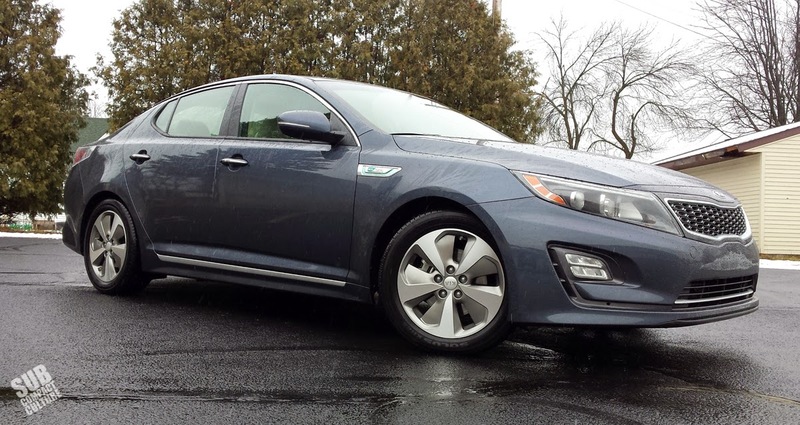 The Optima Hybrid does feel as if it's got a significant, solid mass to it which adds to its well-built demeanor. We’ve always thought the Optima was an attractive looking car, and that goes for this model, too. It has a unique front fascia, and I love the four-pod fog lights. It’s got a high, attractive beltline, but that can make it feel like you’re sitting in a bathtub, as the door panels are quite tall. As a side note, the left-rear taillight had condensation in it nearly the entire time. In lieu of its smallish trunk and low seats, the Optima EX Hybrid proved to be a great vehicle for urban jaunts and long highway cruises. At a bit more than $32,000, the Optima EX Hybrid is fairly priced for what you get, although we would’ve liked to have seen a moonroof included. It’s quiet, roomy, comfortable, and frugal, and it hauled us around the highways and byways of the upper Midwest in a very comfy fashion. 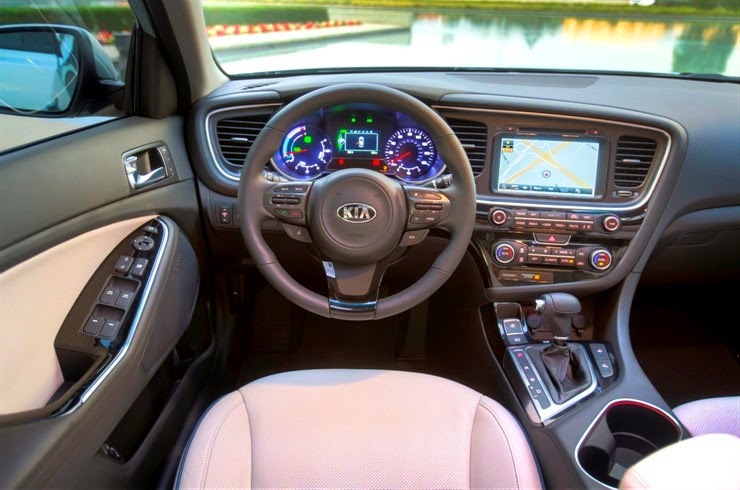 Those looking for a midsized sedan with good gas mileage should definitely give this Kia a look. After all, sometimes you need to have something a bit bigger from time to time.